Accessories and specialty products round out your protection. 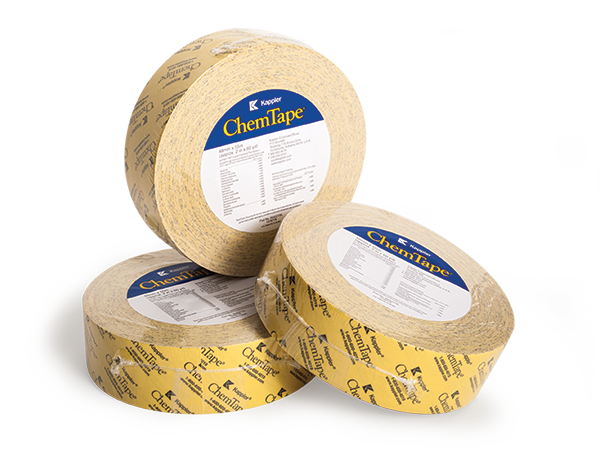 ChemTape is Kappler’s patented chemical-resistant tape designed specifically for protective apparel. Provides added assurance for taping around gloves, boots, respirators and storm flaps, plus shelter-in-place applications. Rolls are 2” X 60 yd (48 mm wide and 55 meters long); 24 rolls per case. Style 99402 YW. 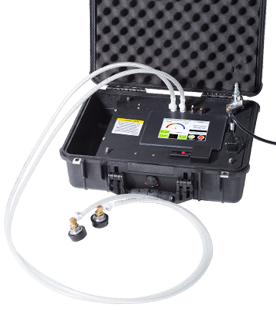 Kappler’s automated Digital Pressure Test Kit improves the efficiency and accuracy of gas-tight garment tests for both ASTM and CE methods. Our unique design features a digital readout for more accurate testing, while a large LCD touchscreen allows easy test criteria selection and data input. All fittings and hoses are included – the user simply provides an air supply with a 1/4 inch MNPT fitting. Press START and the test is performed automatically, allowing the user to handle other duties while the test is in process. For easy and accurate record-keeping, test data can be copied to the provided USB stick via the built-in USB port. A video of the test procedure and data formatting program can be found here. Kappler’s 2N1® Glove System – a true innovation that eliminates the problem of inner glove inversion when the user removes a hand from the double-glove configuration common to gas-tight garments. This allows the user to easily remove or reinsert the hands into the glove without the annoying inversion. This is especially helpful when a user needs to free the hands inside the suit to adjust the respirator face piece, or access communication system or other equipment. The 2N1 Glove System also provides improved comfort and manual dexterity with a unique glove configuration. Contact Customer Service for style options. 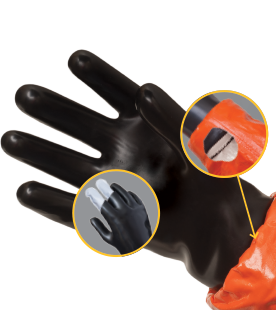 The 2N1 Glove System is available on Kappler Zytron® 500 Hazmat styles and NFPA Certified styles in both Zytron® 300, 500 and Frontline® 500 fabrics. Kappler’s Zytron 300 Half C Jacket is ideal for supplied-air work applications. The flat back design includes hood with PVC faceshield, double storm flap with hook and loop closure, and attached CP Cuff Option for easy glove taping. Loops for air system are attached inside the hood. 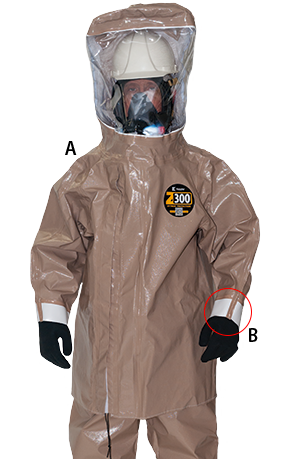 Style Z3H763 (style Z3H763-30 includes tubes and Nupro valve), 6 garments per case. Taping gloves with ChemTape® has become standard procedure for good protection. Our CP Cuff Option, available on any Kappler taped seam chemical garment, makes the job faster, easier and more effective. Eliminate chemical burns on hands and wrists – ask Customer Service about adding the CP Cuff Option to your next apparel order. Kappler’s patented Decontamination Shower is made with Zytron 500 fabric to ensure hazardous material run-off is safely contained. 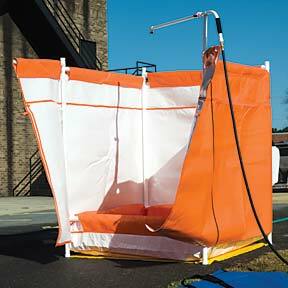 The removable spray wand with adjustable shut-off valve and ergo-grip handle allow better water control during decon. Simple design and snap-lock components mean easy setup and take-down. Catch Basin w/frame and shower wand, Style Z5HD0. Shower curtain and frame, Style Z5HD1. 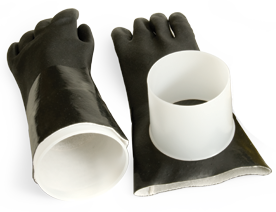 Kappler’s insert cones interface glove to suit and provide smooth taping surface. 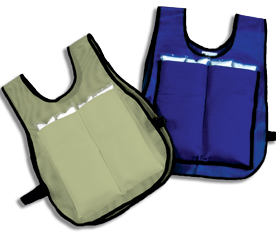 The Kappler Cooling Vest with patented Phase Change Material is far superior to traditional cooling systems. It's lightweight and can provide hours of cooling without the discomfort, vaso-constriction or moisture build-up common to other products.